An enraged wife took revenge to shocking new levels when she tracked down her husband’s alleged mistress. 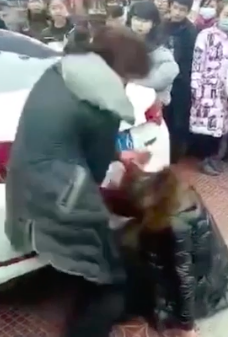 The furious woman, from Tangshan City in North China’s Hebei Province, held the woman by her hair as she rang her husband, requesting he come and watch her enact her punishment. 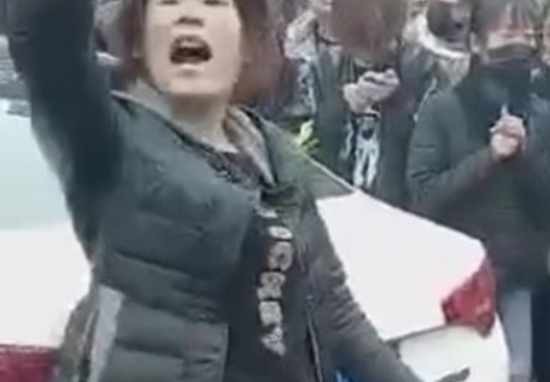 Crowds gathered around the women to film the shocking public incident on their phones, but this did not seem to deter the fuming spouse who appeared triumphant at having captured her love rival. Hubby, where are you? Come here. I’ve caught her, hurry up! Tell everyone what you are. Tell them you’re a mistress. Tell them! This is a mistress. She’s a home-wrecker. Three years she’s been with my spouse. The mistress is seen begging the wife for mercy, however her pleas were only met with further ridicule. The crowds of interested onlookers can be heard laughing as the footage reaches the end. The footage has since gone viral, with many people offering their personal opinion on the messy love triangle. Then he should have just gotten a divorce and the mistress should have respected herself more. Three years. Is it really the fault of the mistress? Who knows what she was told. All the audience with phones on record,ffs what have we become? Then he should have just gotten a divorce and the mistress should have respected herself more. Three years ? However, others have laid the blame on the vengeful wife, describing her as a ‘disturbed’ individual.